On the 'which people?' question it seems clear that firstly, it should be the intended beneficiaries (not foreign 'experts') who are the primary authors, architects and principal actors in any ICT4D initiatives, and that secondly, such initiatives must prioritise building people's informational capabilities to make effective use of ICTs to produce development that they have reason to value. If we accept Kentaro Toyama's maxim that ICTs can only amplify existing capacity and intent, then logically ICT4D initiatives must make much greater investments in building the capacity and critical capabilities of excluded groups ahead of applying technology. The "whose knowledge?" question is also crucial. As Duncan pointed out in his post "The Revolution will NOT be in Open Data", "Knowledge is what you know. It’s the result of information you’ve consumed, your education, your culture, beliefs, religion, experience – it’s intertwined with the society within which you live". If your cultural, religious or educational experience has taught you that you that people like you should 'know your place' and suffer in silence, then that given 'knowledge' can be a powerful obstacle to your self-development. Development initiatives can effectively tackle these obstacles by including activities that provide access to alternative information and which build critical consciosuness. Participant groups can discuss their own experience, analyse the root causes of their social circumstances, and determine ways that they can act collectively to secure socially just development. When people's critical agency is enhanced in this way, alongside their collective intent to act for change, there's no question that technology can amplify this capacity and intent. Whilst there has been plenty of showcasing of top tech initiatives there has been relatively little discussion about exactly what we mean by 'technology'. 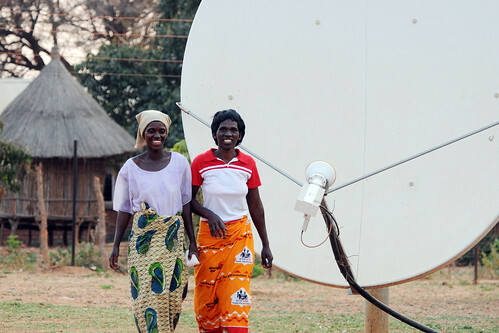 The 'T' is perhaps the most taken-for-granted element in the whole ICT4D equation? For me, the point here is two-fold, that there is no development without technology (by definition) but also that no development should be technocentric. People always have, and always will, make use of appropriate(d) technologies in their efforts to improve their lives. Indeed no social, economic or human development has ever been achieved without the application of technology of some kind. However, as Ken Banks has argued, it's an 'inconvenient truth' that much ICT4D centres around top-down, 'technology as solution' models. A less technocratic and more people-centred ICT4D process would need to improve people's sense of agency and critical capabilities to analyse their own social circumstances and to address the root causes of injustice, and would need to increase people's capabilities to effectively use technology to define and bring about the development (ends and means) that they have reason to value. Do you think that this is an improvement on people + knowledge + technology = development ? What is still missing or just plain wrong here? Permalink Submitted by Caitlin (not verified) on 12 November, 2013 - 10:26. Permalink Submitted by Tony on 12 November, 2013 - 18:42. Thanks Caitlin. What do you suggest that would be less vague? For me theories of change are one way of asking 'what needs happen for change to occur?' Given the obscene levels of social inequality and injustice I am interested in why we acquiesce and how we act for change. I am curious about why we are so passive both as individuals and social groups. I agree that transformational social change necessarily requires collective action - no question - but also conscious that my personal biography, as well as my social group membership, informs my acquiescence and my resistance. So I am using 'people' vaguely to include both individual and collective action and using 'people-centred' mainly to counter the technocentric and technocratic biases of much ICT4D. I am interested to hear more about the 'dimension beyond critical consciousness related to responsibilities to wards each other' and 'immanent development'. Permalink Submitted by Anand Sheombar (not verified) on 14 November, 2013 - 16:36. Permalink Submitted by Tony on 19 November, 2013 - 18:05. Hi Anand, thanks. I am optimistic about people's ability to appropriate the possibilities of social network and open data. My concern is that those people who have priviledged access to technology - by virtue of their existing economic and social advantages - are actually the people that will benefit most from it. It seems to me that there is potential for the 'long tail' to get longer and thinner, and for the already fat to get even fatter. As Alison says in her conclusion, "unfortunately, most of the [Kiva] borrowers have low literacy levels and don‘t have access to technology so they cannot tell their own stories in their own voices". But even if they did (as Andrea says on p117) a citizens' voice depends on much more than just the availability of the technology. On this reading Development 2.0 is based on the theory (of change) that if we just add technology to development-as-usual, all we then have to do is stand back and wait for the magic to happen. In reality geting to a point where persistently disadvantaged groups are able to effectively use new technologies in their struggle to close the gap on socially advantaged groups requires more discussion about how exactly to impact the structural causes of that disadvantage. In addition to 'the application of Web 2.0 thinking to development studies' maybe we also need to see the the application of critical-theory-thinking to ICT4D? Permalink Submitted by Gertjan van Stam (not verified) on 17 November, 2013 - 09:47. Permalink Submitted by Tony on 20 November, 2013 - 11:37. Hi Gertjan, you pose a crucial question that has no simple answer. It is not only that my assessment of what constitutes development may be significantly different to that of someone from a foreign culture, it is also likely that my definition and priorities may differ significantly from that of my neighbour or sibling. Each person's context is unique, shaped by their particular biography and life experiences. At the same time there are factors which may cause people to share a definition of valued 'development' or 'progress'. This may be because of a shared geographical context but it could just as easily unite people from geographically distinct places by virtue of a shared shared identity as members of the same religion, gender, or philosophical belief-system. Development agencies often try to discover what local development priorities exist by holding inclusive community discussions. I think this is an essential part of the process. However there are always voices that are not heard and taboo subjects that cannot be spoken in public fora. The development priorities of vocal community leaders may differ radically from somebody suffering domestic abuse or being forced into an early marriage. The challenge is to create public spaces where all voices can be heard, where the interests causing injustice can be revealed and appropriate action agreed to deliver developments that are collectively valued. I think that ICTs can play a part in enabling those suffering abuse or discrimination to support each other and build communities of shared interest and to build commitment to act for change. ICTs can be used to create spaces to discuss taboo subjects and to rehearse resistance before acting off-line. I am sure that your researchers will reveal many other ways that ICT can be applied by people to overcome the contraints that prevent the from living the lives that they would most value.